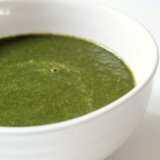 Benchmark Medical GroupBlogBlogSuper healthy green soup! Combine all the ingredients in a large pot and bring to a boil over high heat. Reduce heat to medium, cover, and simmer for 20 to 30 minutes, until the vegetables are tender. Working in batches, transfer the broth and vegetables to a blender or food processor and blend until smooth. Taste between pulses and add salt and pepper as necessary before continuing. Serve immediately and refrigerate or freeze the remaining portion.